The elk is one of Rocky Mountain National Park most well known attractions. Each fall millions of people flock to RMNP to watch the elk rut unfold in the meadows of the park as bull elk vie for the attention of the females. Hearing a bull elk bugle for the first time is an amazing experience. In the true spirit of Rocky Mountain National Park I was able to photograph this bull elk keeping a close eye on his harem as other bulls attempted to outdue his prominance over his harem. 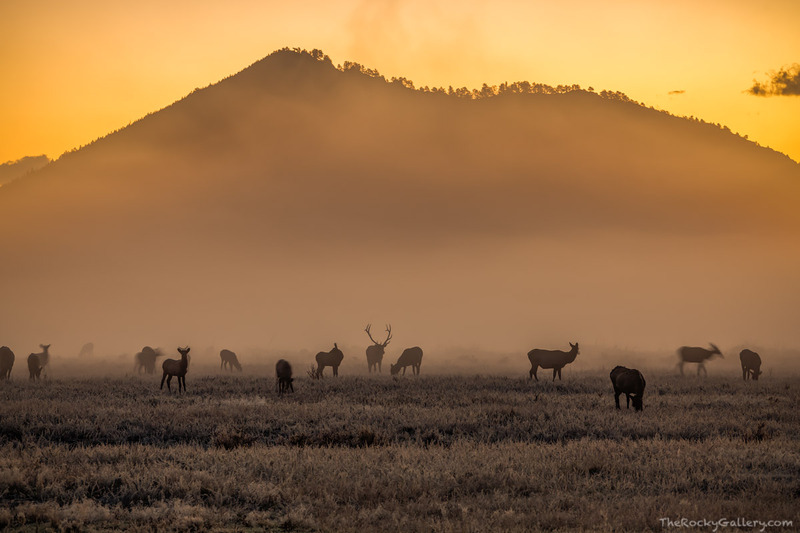 Moraine Park had low lying fog this morning and with the sun rising behind Eagle Cliff Mountain while elk bugles sounded off, one could only feel a sense of wonder and awe at the spirit of the west and Rocky Mountain National Park this scene encompassed. Photo © copyright by Thomas Mangan.